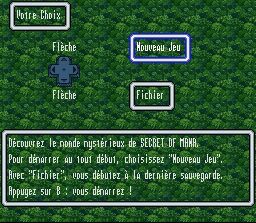 Welcome on Secret of Mana test page. You will find here a complete description of the game accompanied with comments. No technical notes in this column, only a global note (100 % obviously!) which takes into account the fact that perfect game has all the same its small defects. Released in Japan in 1993. Released in United States in 1993. Released in France and Europe at the end of 1994. In France, game is sold accompanied with a very complete strategic guide which is not a solution but rather a small guide which helps you to know where to go. Personally, I never used it except for scaning magnificent illustrations. In United States, no guide but a simple instructions booklet (that you can download in Mana Book topic) in the usual size which resumes very briefly the concept of the guide but which stops in the beginning, inciting the reader to buy the complete guide! Side intro, a very beautiful image in bottom of screen which already plunges us into the atmosphere of this game. Always in the intro, Angel's fear shows us that the game is on of the best game ever seen. Let's continue our beautiful course with the menu. Beautiful trees in bottom of screen! You choose if you want to start from the beginning or if you want to open a file. 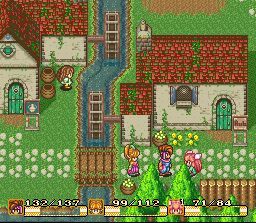 In Secret of Mana, you begin with a single player, the boy, Randi. Then, you get acquainted of the girl, Purim. 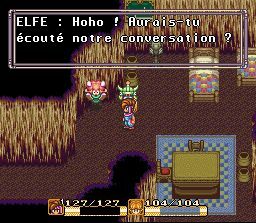 Finally, it is the elf that you meet, Popoie. You have to control 3 players. If you play single, it is necessary to configure the behavior of the 2 others. To do so, you have an action grid. According to the behavior which you want that your persons adopt, you place your person on the grid. For example, here, the elf attacks briefly then moves back. It is the best configuration. Indeed, if you choose to attack, your character is going to take himself quite a lot of knocks and is going very quickly to empty your reserve of candies. If you put your characters on guard, he's won't attack! What is great in this game is that you can play with one pr two others players! In this case, you need 3 controllers and it is necessary that the others follow you, otherwise you can not progress. The playability of this game is excellent. 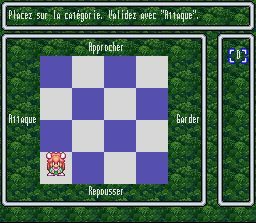 Of type " A-RPG " (Action RPG), you fight in real time as in Zelda and RPG characteristics preserved: possibility of missing an opponent, minimal time to wait before knocking again... Nothing was left! Only drawback; the players can remain wedged in auto mode what prevents you from progressing and can put you in danger. In this way there's very good work. In all levels Square made good job. Beautiful places plunge us into the unique universe of this game. Graphics are very rich on one hand at the level of colours but also at the level of the complexity and of the variety of textures used. 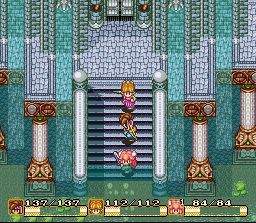 Music is excellent and I know more than a who is touched by listening of Angel Fear, Secret of Mana's main theme. 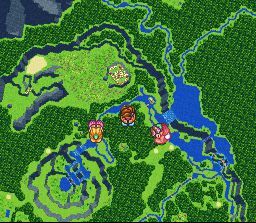 To download the music, go to Secret of Mana Music page. -A bit baroque style with harpsichord with among others Into the Thick of It (main theme in the forest). -A more traditional style with classical musics with Eternal Recurrence (Ondine), The Legend (Socrates) or fabulous Star of Darkness (Mana Fort). -A more festive style with the Flammy's magnificent theme: Flight into the Unknown. -The second versions of great themes as Did You See the Sea? That depends on the time which you spend to play. Average for a player who has never finished it and who has never played a RPG is of 1 month. 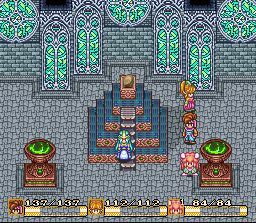 For the RPG fans, you will need a week at least to arrive at the end of this game. Story is not of the most commonplace. 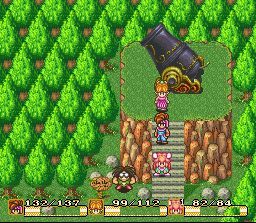 A young man named Randi is banished from his village because he removed the sword Mana of its pedestal. Helped by Gemma, he has to restore balance between the good and the evil (which got the upper hand). Story is very rich in new developments and one goes from surprise to surprise. The usual note of humor was not forgotten either. Elf: What an actor I am! I'm so good! This guy was crying! 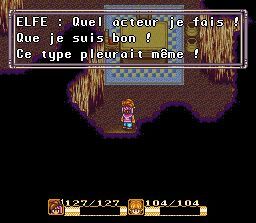 Elf: Oups! Did you hear our conversation? The game is excellent; it's an action game and also a RPG. The global note is consequently 100 %, in spite of some small defects.